I wanted to share my May Beauty Favorites with you! These are the products that I can’t get enough of lately. If you like this video please subscribe and share! I’m sure this one comes as no surprise, considering my rave review. Currently I have Vivid Violet (diluted with 50% conditioner), Wild Orchid and Green (diluted with 80% conditioner and a splash of SFX Blue Haired Freak). See my purple gradient tutorial. I love the new shadows that I picked up from Makeup Geek. See my swatches here and here. This is a beautiful, complex purple. See my review. I love this! I use this alone with Anastasia Lash Genius or as a mascara primer. I really like how this mascara helps to separate and elongate my lashes. I love using this as a primer or topcoat (or both) to really waterproof my mascara if I’m going to be outside in the heat and humidity. This is the perfect no flush blush shade. It really goes with anything. See my review. What are your May Beauty favorites? Let me know below! The brushes look great ! 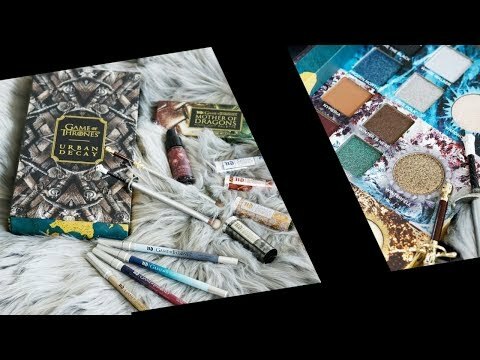 I’ve been loving Makeup Geek as well! Love those lip colors too- I need to try them! the Josie Maran lip and cheek creamy oil is on my list of items to pick up. I need to get in on the MUG products. It seems like Marlena is really on point with her products. I’ve been lusting that Josie Maran for months because of you. I’m buying today. Those liquid lipsticks are gorgeous, especially Purple Poison and three witches. Oh, I am so wanting those MUG shadows. Those pretty zombie lips are gorgeous! Those liquid lippies are the-bomb-of-a-lifetime! Crazy pigmentation, I should by them! I needto try that NYX primer! You always discover the best items. I saw Cargo at Kohl’s today but I’ve got too many mascaras to try first. I’ve been dying to try the Argan lip and cheek products from Josie Maran! Such a great selection of favorites! Wow! That’s a great bunch of faves. A good variety to look at. Definitely putting those MUG brushes on my wish list!! I have to try those Cargo mascaras! They make a nighttime one that I’m using too. The wand on the cargo hd mascara is So mezmerizing! Nice faves. I always leave this blog enabled. Yay what are you lemming right now? I just made my first MUG purchase and excited to try them out! I ADORE Anastasia Lash Genius!!! Of course, now I want to check out the Pretty Zombie Vegan Liquid Lipsticks!!! It works with every mascara. Priceless! I love the Lash Genius as well. I use it every day over whatever mascara I happen to be using. Now I want the those Josie Moran blushes, damn you *shakes fist*. All of them. Like I really need more blushes but these look like they are different than anything else. Just ordered the Angel Veil primer!! Those brushes look really nice. I lost my favorite eye makeup brushes a couple weeks ago, but at least I still have my good foundation brushes. BTW, still loving my Cover FX concealer! Boo on losing makeup brushes! I have got to try that NYX Angel Veil Primer!! Maybe a silly question, but do you go to a salon for your colorings, (I love your current hair color!)? I have been going to salons for color but I have no salons that are close to me use CF products…which makes me super uncomfortable going to them. Any advice??? i do my hair myself 🙂 I got tired of paying $200-$300 for the color I wanted done and just started doing it on my own.